This year, the Emmys felt like a victory lap for diversity. Sterling K. Brown and Courtney B. Vance took home trophies for their roles in The People v. O.J. Simpson: American Crime Story, while Rami Malek was recognized for his lead role in Mr. Robot. Regina King was a repeat winner for American Crime. Sarah Paulson, who is openly gay, won for The People v. O.J. Simpson: American Crime Story. Susanne Biers won for directing The Night Manager. And in a sign of the times, Transparent actor Jeffrey Tambor called for an end to cisgender actors portraying transgender people, while Jill Soloway, who also won for directing, told the audience to “topple the patriarchy.” Both Biers and Soloway were the only women nominated in their categories. Things are far from perfect, as evidenced by a recent report from the Directors Guild of America tabulating the lack of female and nonwhite television directors. The vast majority of television is still disproportionately directed by white men. We’re enjoying this moment in television diversity in no small part because of the internet. The same force that’s blamed for shrinking newsrooms and the downfall of the American newspaper is also the democratizing force that’s made it more difficult to get away with creating all-white shows and behaving as though they’re normal. There’s a reason that Emmys host Jimmy Kimmel was poking fun at the Oscars. After all, the damnable hashtag everyone knows isn’t #EmmysSoWhite. Aside from its power to name and shame, the internet is responsible for ushering in a post-ratings age of choice when it comes to how and where we watch TV. We are living in the age of specificity. It’s odd then, that in a year that feels like a boon when it comes to nonwhite faces on TV, the corps of people vigorously covering it is still so white. In some ways, the Television Critics Association press tour feels like a weird anachronism. For starters, it’s noticeably, abnormally, uncomfortably white. Melanie McFarland, the television critic for Salon who currently serves as treasurer of TCA, estimated that out of the organization’s 220 or so members, “you can generously say like 20 or 30 of them are people of color … in proportion, it’s not a whole lot of us and it never has been.” When I attended this summer, I counted seven black journalists, including myself. Twice a year, several hundred reporters from all over the country descend upon a California (either in Pasadena or Beverly Hills) hotel ballroom for approximately two weeks. Usually, we’ve been given screeners of the shows up for discussion. At the very least, we see clips. Back in the ’70s, when press tour began, it functioned as a way for television journalists at midsize newspapers around the country — back when it was still perfectly normal for regional newspapers to have multiple TV writers, believe it or not — to talk to the people they wrote about. Now it’s become an essential tool for sorting through the more than 400 scripted shows that make up Peak TV. It’s also an opportunity to ask questions of network executives, producers and actors during panel discussions. If you’re a person who covers television, the TCA press tour offers valuable context about how things work, and a chance to hold network executives accountable for all sorts of decisions. I had a sit-down with PBS president and chief executive Paula Kerger at TCA this summer, and that’s when I asked her about the lack of diversity in the dramas that air on Masterpiece. Todd VanDerWerff, who is now Vox’s critic at large and a TCA member, wrote a defense of the whole enterprise aptly named Why the Television Critics Association press tour still matters when he was at the A.V. Club. He wrote a similar one in 2014 for Vox. And he’s right in both. Press tour does still matter. It’s just super white. 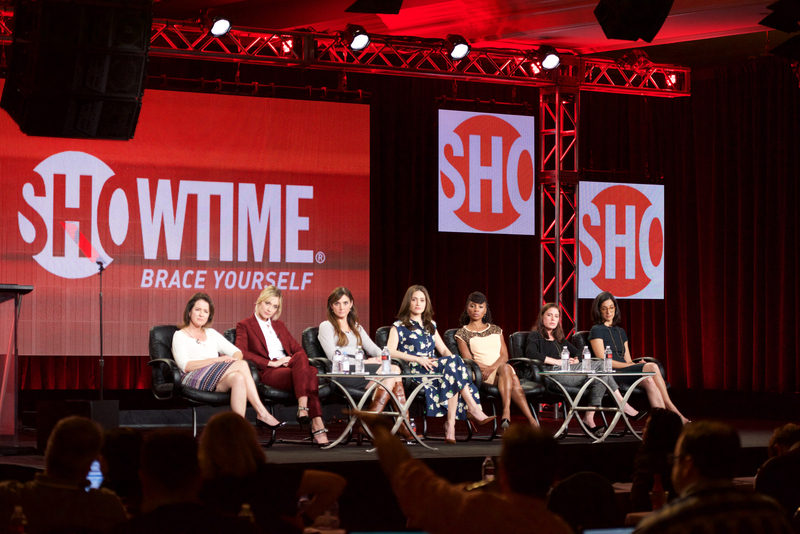 From left to right: Screenwriter Michelle Ashford, actress Caitlin FitzGerald, executive producer Nancy M. Pimental, actresses Emmy Rossum, Shanola Hampton, Maura Tierney, and creator and executive producer Sarah Treem speak onstage during the “Sexuality And Television: A Female Perspective” panel as part of the CBS/Showtime 2015 Winter Television Critics Association press tour at the Langham Huntington Hotel and Spa on Jan. 12, 2015, in Pasadena, California. So what does happens when journalists of color are missing from press tour? One of the things I noticed very quickly is the difference in the questions that are addressed to white producers and talent versus people of color. The first group gets to answer questions primarily about the art and construction of their shows, from the writing to the characters to the music choices and everything in between, while the second is tasked with most of the heavy lifting when it comes to talking about television and race. Producer Shonda Rhimes deserves a lot of credit for this current wave of diversity on television, which began when people started to notice the utter normalcy of the casts of Grey’s Anatomy and Scandal. Rhimes had the ratings to back her up, but Shondaland shows drew recognition for dominating the Twittersphere. Now, Hollywood trade paper Variety doesn’t just run regular ratings, it runs social ratings too. But she has gotten fed up with continually being questioned about diversity and little else, and this summer, black-ish showrunner Kenya Barris and actress Tracee Ellis Ross called out the practice. Mary McNamara of the Los Angeles Times won the 2014 Pulitzer for criticism in part because of her coverage of diversity. Maureen Ryan has been a stalwart in pressing network executives about diversity as well. But longtime critics I spoke with noted that questions about diversity are expected now as a matter of course, as opposed to 1999, when the NAACP threatened to sue the major broadcast networks over their lack of diversity. “Those issues are generally not, until recently I would say, those issues are not front and center for most critics because they feel it’s not something they have to necessarily worry about,” McFarland said. Part of what we’re seeing are the aftershocks from upheaval in media. The newspaper industry has shrunk as a whole, and that’s been especially detrimental for journalists of color. That said, there are writers of color doing valuable and important work writing about television, including Bethonie Butler, Rembert Browne, Pilot Viruet, Ira Madison III, Alanna Bennett, Dave Schilling, and, before she stopped, Danielle Henderson. But none of them are full-time TV critics, and none of them go to TCA. It took a long time for television criticism to be recognized as a legitimate form of art criticism and for the medium itself to be recognized as meaningful art. Now that it has, people of color are still largely missing from the positions charged with evaluating television that way. Deggans, McFarland, Inkoo Kang at MTV and Sonia Saraiya at Variety are notable exceptions. Criticism, especially the sort that Nussbaum does for The New Yorker, is increasingly seen as a luxury. Earlier this year in a column for The Guardian, Columbia journalism professor Howard French seethed about how black journalists are still “typecast” into stereotypical roles. That bifurcation that French talks about is still around, but in a slightly different context. For Henderson, that chasm was painfully evident in television writing. Henderson, 39, is a former academic and the creator of Feminist Ryan Gosling. She also spent five years as a popular, well-respected voice writing about television, but finally abandoned the pursuit, she told me, because of typecasting and a seemingly impermeable wall when it came to breaking into fulltime criticism. She attributed that wall, at least in part, to her race and her gender — editors, she said, would routinely make her the “black girl critic” while her white counterparts faced no such categorization. There are an enormous amount of people of color writing about television on the internet from a social justice or sociological perspective. It’s important work. But when the bulk of the writing about shows starring people of color gets shunted off solely or largely as “diversity work,” chiefly concerned with questions of representation and little else, there’s a larger effect. Henderson now writes television. Last October, she left freelancing behind to write for the Hulu show Difficult People, and this summer she was on the staff of HBO’s Divorce. She’s continuing to write for shows, and she’s also working on her next book, a memoir due out in 2018. The treatment of black talent at TCA mirrors what Henderson experienced covering television, where people of color are seen first as vehicles to discuss race and as artists or writers second. Neither of those things changes until it becomes normal to see people of color on both sides of the room — on the stage answering questions about shows, and in the ballroom audience, where the press is doing the asking.